the model number and serial number (located on the bottom of the case) below. regulations for Class B certification. charge to the purchaser for parts or labor for the time period(s) set forth below. the steps set forth below and provide proof of purchase to the servicer. rubber parts, or peripherals other than the Product. be sure it is packaged carefully. by Sharp and shall be the sole and exclusive remedy available to the purchaser. 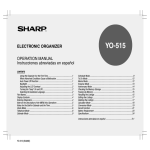 Congratulations on purchasing the YO-470 Electronic Organizer. operation. For quick reference, keep this operation manual on hand. available at the time you purchase this product. Check with your local SHARP dealer concerning availability. battery life has expired, or any other case. numbers, the loss or alteration of stored data, etc. next step in either case. The Organizer is initialized and the TEL1 directory is displayed. use.) Press ON to resume operation. none of the keys have been pressed for fifteen seconds. The secret function is in effect. excessive use of the Backlight will significantly reduce your battery life. (at an ambient temperature of 25°C/77°F and 65% humidity). * This figure may vary depending on the surrounding environment. the desired key to be entered. Press N when you wish to start the operation soon. For more information, refer to page 31, “Freeing up memory”. not used in this product. function enclosed in a box. To practice entering characters and numbers, select the MEMO mode. : Moves the cursor to the right. : Moves the cursor to the left. : Moves the cursor up to the previous line. : Moves the cursor down to the next line. : Deletes the character at the cursor. : Deletes the character to the left of the cursor (“backspace”). : Moves the cursor to the beginning of the next line (new line). : Clears the data being entered. : Stores the data being displayed. Press CLOCK to display the HOME time. NOTE: The date format can be changed. Refer to page 31. 1. Display the HOME clock. Press INS again to exit the insert mode. • Pressing C•CE deletes the data currently being entered. 3. Display the desired city name from the cities stored in the Organizer. 4. Set the HOME city. set the correct time after setting or changing the HOME or WORLD city. • For zone numbers 0, 14, and 15, the city name display is blank. zone number. The default city for the WORLD time is London. 6. Press ENTER to start the clock from 0 seconds of the specified time. 3. Select the time system. 1. Display the WORLD clock. The current city setting appears on the display. step 3) on page 6 to select the city name you want. 3. Enter the correct DST time. 1. Display the WORLD clock and enter the edit mode. The cursor flashes on the city name line. 3. Enter the city name (up to 8 characters). 4. Press 2nd ENTER . ” appears on the display and DST is set. other than the DST in step 3. ” disappears and DST is cleared. not changed. After this operation, the clock starts from 0 seconds. 4. Press ENTER to store the name. cursor to the city name line. 2. Enter the edit mode and change the setting. Perform the same steps as those used to set the DST. ” disappears and the time for all WORLD cities is one hour back. to the month presently on the display. attached to the years 2000 to 2099.
and PREV , or designating the year and month. scrolls into the next screen. CALENDAR to return the calendar to the current date. To change the date, move the cursor with the cursor movement keys. To clear the displayed date, press C•CE . The specified monthly calendar will be displayed. 3. By recalling the desired date directly in the SCHEDULE mode. the same for all three methods. clear upon recognition of the new entry. 7. Enter the schedule detail. 2. Change the calendar to February 1999. If an anniversary has been set, the tag will appear in the center. 4. Store the scheduled meeting in the memory. 2. Recalling scheduled items from the CALENDAR mode. 4. Recalling only scheduled dates (skip empty dates). 6. Recalling scheduled items using the first letter(s) of the item. 8. Recalling scheduled items using the index display. pressing C•CE , entering the date, and pressing ENTER . 1. Select the SCHEDULE mode to display today’s schedule. on the same day, use NEXT to recall them in chronological order. 1. Search for all days containing scheduled items. NEXT to recall the next scheduled items. PREV references scheduled items in reverse. distant future scheduled item is displayed. This method is handy for recalling scheduled items which are far away. 2. Enter the first letter(s) and begin the search. • This search is not case sensitive. 1. Recall the schedule for January 1, 1999. 2. Enter the keyword for the search and begin the search. 1999 will appear on the display. • The keyword search is not case sensitive. are scheduled, “NOT FOUND!” will appear on the display. 1 above, the index display will start at the earliest scheduled item. The first 12 characters of the first line of each entry are displayed. 2. Select the entry you want to check. 1. Recall the schedule data to be changed. that day, the next or the last entry will be at the top. You can also display an index of entries for a desired date. 1. Select the SCHEDULE mode and enter the date you want to check. 1. Recall the items scheduled for February 19 and enter the edit mode. NOTE: You can also delete individual entries from the index display. 2. Delete the agenda for an entire month. 1. Deleting one agenda item at a time. 2. Deleting the agenda for an entire month. 3. Deleting all of the data in the schedule memory. Refer to “Deleting all of the data in each function” on page 30. 1) Select an agenda item and mark it for the alarm with “ ”. 2) Activate the alarm for that item with “ ”. on the agenda by pressing 2nd ALARM . alarm will be canceled and “ ” will disappear from the display. an anniversary for every year from 1901 to 2099.
will remain in memory without “ ”. remain in front of the scheduled item. transferring data or freeing up memory. 2. Enter the date and label. 4. Enter the description, then press ENTER . 1 in the procedures below. sequential search or in the index display. 1. Recall the entry to be changed. to change and change it. in calendar sequence (forward or backward). Select the ANNIVERSARY mode and display the index. Up to five entries are displayed at a time. entries. Press ENTER to display details of the entry. appear at the top of the list. 1. Recall the entry to be deleted. 2. Store the directory filenames. • Use up to 10 letters for designating a filename. • To discontinue the entry of a directory filename, press C•CE twice. 2. Recall the first entry. PREV recalls the entries in reverse order. 1. First select the TEL mode (TEL1 directory). 2. Press C•CE E NEXT . subsequent entry found is displayed. This search is not case sensitive. 1. Select the TEL mode (TEL1 directory). “ABC Co.”. This search is not case sensitive. The first 18 characters of the first line of each entry are displayed. subsequent entry will be displayed. To edit an entry, recall it, then press 2nd EDIT to enter the edit mode. to store the new entry. To cancel any changes, press C•CE twice before pressing ENTER . Either a single entry or an entire directory can be deleted. Pressing NEXT and PREV scrolls the page forward and backward. select the desired entry, and press ENTER . 1. Select the directory containing the entry to be deleted. 2. Recall the entry to be deleted. Use any of the methods (1 to 3) mentioned above (page 18). entry you want to delete with the pointer “ ” and press DEL and Y .
of information not appropriate for the schedule or other directories. entered, the matched memo is displayed. Always press ENTER to store the memo. 1. Select the MEMO mode and recall the entry. searches in the same direction as in the sequential search. 1. Enter the keyword in the MEMO mode. INDEX in the MEMO mode. memos a page at a time. Memo editing capabilities are similar to those in the SCHEDULE mode. To edit a memo, recall it, then press 2nd EDIT to enter the edit mode. memo to be deleted with the pointer “ ”, and press DEL and Y . Either a single memo or the entire memo list can be deleted. 3. Move “memo2” after “memo4”. After the deletion, the next item will appear. 4. Store the new order. • Press C•CE to cancel any changes. things you have to do in order of priority. 1. Select the TO DO mode. displayed. This search is not case sensitive. 2. Enter a description about the activity, then press ENTER . entry, “NOT FOUND!” is displayed. This search is not case sensitive. description for the new entry. blank by pressing ENTER . Small letters cannot be entered. INDEX in the TO DO mode. ENTER to display the details of the entry. INDEX , or from the first entry if you are at the initial entry display. TO DO items can be deleted in three ways. display. Recall the whole entry, or select the entry in the index display. 1. Select the TO DO mode and go to the index display. 2. Move the pointer to select the “Prepare ...” entry. 3. Mark it as done. ” have the lowest priority. ENTER to store the new entry. to see the total expenses for a single day or for a certain period. 1. Select the EXPENSE mode. 2. Store the expense date. 3. Enter the expense amount. • Press C•CE to cancel the entry. • The description field can be skipped by pressing ENTER . EXPENSE records are sorted and stored in chronological order. The first 12 characters of the first line of each record are displayed. ENTER to display details of the record. for that day, the closest entry after or before the day will be at the top. are invisible and not included in summaries. • If an inappropriate date is input, no calculation will be made. 1. Display the “EXPENSE REPORT”. INS , and DEL . To clear a field data, move the cursor to the field, then press C•CE . After making changes, press ENTER to store the new entry. 4. Press ENTER to return to the date input display. retain the record, press N .
summaries for a specific day and for a certain period can be displayed. 2. Enter the start date (March 9, 1999, for example). calculations with up to 12 digits. function. Before performing any calculation, press C•CE twice to clear the display. the divisor becomes a constant. MEMO, TO DO, ANNIVERSARY, and EXPENSE modes. 1. Press CALC/CONV ( CALC/CONV ). press NEXT or PREV repeatedly. 4. Enter the conversion rate. 1. Display the password entry prompt. 2. Enter “1234” as the password. • Up to 10 digits can be entered for a conversion rate. • Up to 12 digits can be used for a calculation. and “ S ” will appear. After rechecking the password, press C•CE . 1. Press NEXT or PREV to select the desired conversion display. • If you forget the password, you will have to erase all your secret data. 29, and delete the previous password and all secret data. 1. Recall the secret data. 4. Press ENTER to store the data. Only data marked with “ ” will be displayed. 3. Store the data as non-secret. 3. Store this data as secret data. Perform the steps below to declassify “ABC BANK” for example. 1. Recall the secret function menu. 3. “SECRET DATA IS HIDDEN!” is displayed and “ S ” appears. 3. Select “2:DELETE THE PASSWORD”. 4. Enter the old password and delete it. and initial mode screen is displayed. • The secret function remains on after manual or automatic power off. 5. To register the new password, recall the password entry prompt. 6. Enter the new password, “9876”. the password. Follow the procedure below to delete the password. 1. Turn off the secret function. 2. Recall the secret function menu. BACKLIGHT SETUP, DATE FORMAT, and FREE UP MEMORY. return to the initial screen. to darken or lighten the display. 4. After adjustment, press C•CE . use and also the number of entries stored in the respective functions.
. To return to the menu, press C•CE . unnecessary data and free up memory to make room for new entries. 2. Recall the second list of functions. Select “1:SCHEDULE”, “2:ANN1”, or “3:ANN2”. 4. Change the date format. 1. Press 2nd FUNCTION . 5. Store the new setting. Refer to “What to do if you forget the password” on page 29.
space in the memory of the Organizer. 1. Display the function menu. 2. Display the function list on the second display. Press NEXT to display the following screen. Press ENTER to determine the setup. 3. Select “3:FREE UP MEMORY”. memory will be freed up. message shown on the right. on with the Schedule alarm). – When “DATA DELETION” in FUNCTION menu is selected. that the memory has begun to be freed up automatically. by entry or mode (file). and it can be restored. SHARP-specific cable (CE-300L, optionally available). on the receiving Organizer (to select “RECEIVE”). on the transferring Organizer (to select “SEND”). 6. Data transfer is started. the data transfer is completed. 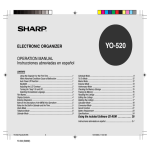 receiving Organizer in step 4. Organizer on the transmitting Organizer. transmitting unit, or both the units. Perform steps 2 to 6 described in “Transferring data by entry”. The OPTION menu is displayed. 4. Press Y to the confirmation on the transmitting Organizer. However, directories in the TEL mode are excluded from this rule. connected correctly, then start the steps again. data in the Organizer with a PC. aborted, data already transferred to the receiving Organizer is cleared. secret function is turned on, data cannot be transferred by mode. information or call SHARP at 800-BE-SHARP. Do not drop it or allow anything to hit it. or hard objects, because they may scratch the Organizer. An impact or a strong external electrical field may disable the keys. breakable (like a pencil point or needle). switch first, then ON . The message below is displayed. solvents (no paint thinner or benzine, etc.). data and resets the clock. • Replace the batteries (page 36). • Adjust the display contrast (page 30). Adjust the display contrast (page 30). Reset the Organizer (page 35). then free up memory (Page 31). weak. Replace the batteries (page 36). The standard built-in clock is powered by the operating batteries. simultaneously. Data in the memory is cleared. • Keep the batteries out of the reach of children. of time, they might leak and cause corrosion inside the Organizer. 3. Remove the used batteries by prying them out with a ball-point pen. When “ BATT ” is displayed, the operating batteries are depleted. 5. Install the new battery with the (+) side facing up. 6. Return the seal in place. batteries are depleted, all of the data in the memory will be lost. all memory is used by a single mode. products and services become available.